The GI Joe 25th Anniversary Collection (TFAC) follows the tradition set by the very first series: namely, reusing sculpts and bodies like there's no tomorrow. Of course, they're being smarter about it, this time - instead of just building generic figures, the recycled bodies have a good reason for being recycled. For instance, the Cobra box set gave us Cobra Commander in his mirrored faceplate, while the first series of individually carded toys gave us his blue cloth hood - same body, but still worth it. In the cartoon, nothing was known about Cobra Commander. 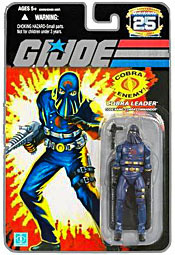 Well, other than that Cobra La crap, which made him some kind of mutant arctic snakeman, but we can safely ignore that. In the comics, the guy got a real history, became a fully fleshed out character. He had a life, a family before Cobra... even had a job. He was a used car salesman, and worked his way up from there. They even showed us what he really looked like under the hood and the helmet. This is a very nice-looking figure. 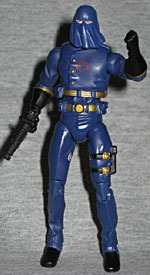 Cobra Commander was originally a fairly skinny guy, but seemed to get bulkier as more and more toys came out. This TFAC figure, though, is right back to his roots - a 98-pound weakling, more or less. His uniform is superficially the same as the one released in 1984, but the detailing is much more intricate today - ah, the march of technology! As we said, this CC's wearing his hood, which makes sense for the single-carded release: Larry Hama was very careful when writing the comics to make sure that the mask was used when in battle, while the hood was more for ceremonial endeavors. Since the box set backdrop shows the figures in the field, the hood wouldn't have been appropriate there. Though the original figure's hood hung straight down, this one is a bit windswept - you can just imagine him standing on some high podium addressing the troops. The Commander's field jacket buttons down the right side of his chest, rather than the center, but it's not quite as far to the right as the original's. By extension, that means the red Cobra symbol on his chest is smaller than you might like. His uniform is dark blue, with gold highlights, which helps set him apart from the other TFAC version. His gloves reach nearly to his elbows, which was a feature of the cartoon, not the old figure, but it's still a cool nod. The pouch strapped to his thigh is completely sculpted, and even the spat/stirrup things at the ends of his pants are fully sculpted and painted all the way under his shoes. Awesome! Cobra Commander's only real accessory is his black laser pistol, but it's just like the one he had back in the day - it even plugs into his back like that old one, though this time it does it with the pistol grip pointing the other way. He has a black display stand with the Cobra logo and his name stamped on the front in white. The back of the card features a "clip and save" file card that goes so far as to copy the typos that were on the original - his secondary specialty is listed as "ordinance," which means "law," when it should be "ordnance," meaning "weapons." The figure is just over 4" tall, and has a balljointed head, shoulders, elbows, torso, hips and ankles, swivel wrists (at the top of the glove) and double-hinged knees. The neck is definitely a balljoint, but the design of the hood keeps it from its full range of motion. The ankles swivel easily enough, but the hinge portion of the balljoint really doesn't want to move - it feels like the foot is going to pop out of place before the darn joint will go. The packaging for the 25th Anniversary Collection is wonderfully retro. Anyone who was toy shopping in the 1980s will instantly recognize this design: the background of the card is black, with the GI Joe logo across the top. The figure is in a simple bubble on the right side of the card, while the left is taken up by a large painting of the character in front of a white, yellow and orange explosion. It's beautiful. They even used the old-school Hasbro logo on the front! In honor of the 25th anniversary, the edges of the card, the logo and the space behind the figure are all metallic silver. The back of the card shows the other figures in this series, plus faded silhouettes of upcoming releases. This is a lot like what Hasbro's done for their Vintage Star Wars figures, but without the idiot clamshell and the huge price tag: when GI Joe debuted in 1982, the figures cost $1.99; today, they cost about $5. Cobra almost didn't exist. When Hasbro went to Marvel to develop the backstory for their new military characters, they only had 10 figures - and they were all good guys. Marvel's first question to Hasbro was "who do they fight?" The Hasbro reps just looked at each other. It was the legendary Archie Goodwin who suggested a paramilitary terrorist group, and made up the name "Cobra" right on the spot. And here we are 25 years later with a new figure of Cobra Commander. What do you think the odds are that the line would have even made it one year, let alone 25, without an enemy to fight?